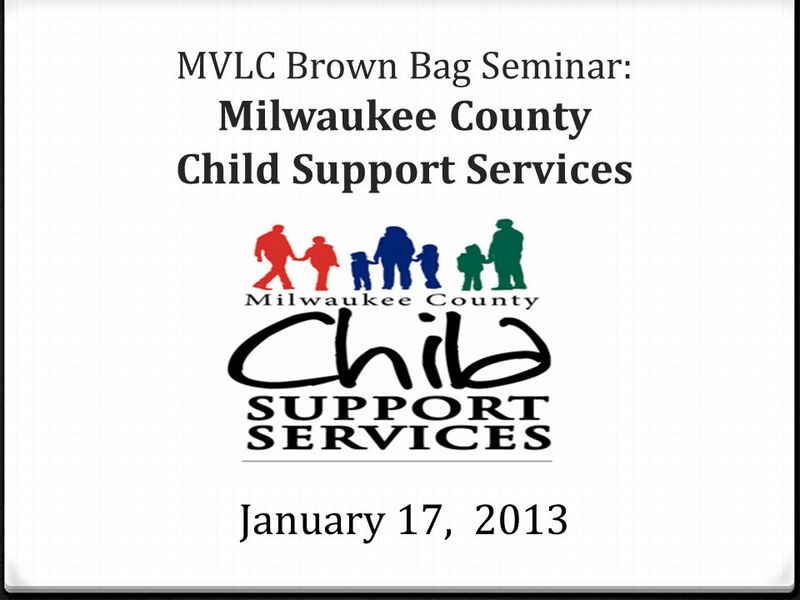 MVLC Brown Bag Seminar: Milwaukee County Child Support Services January 17, 2013. 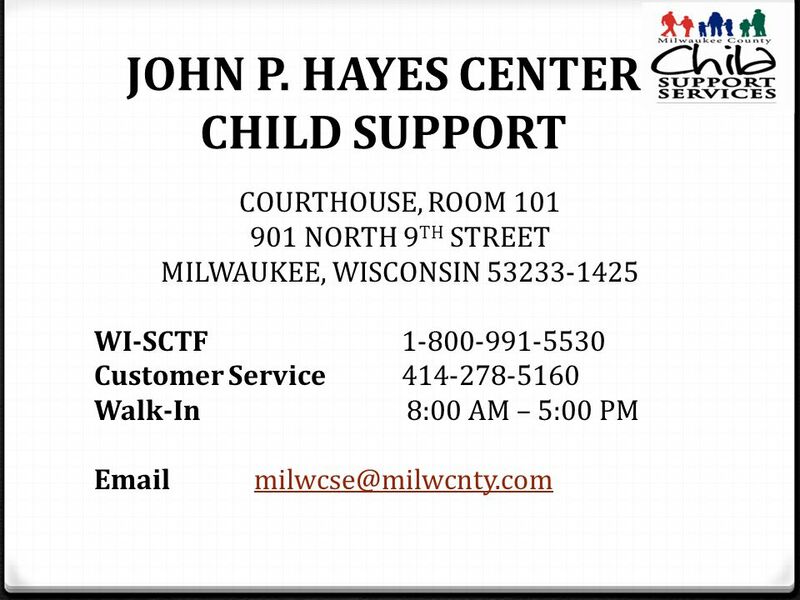 2 This course will provide a brief overview of a child support case, and provide information on the operations of Milwaukee County Child Support Services. 3 The Child Support Program Federal, State and Local Authority 0 Title IV, Part D of the Social Security Act mandated the creation of the child support program. The purpose of the program is to ensure that children receive support from both parents. 0 Wis. Stat. Sec. 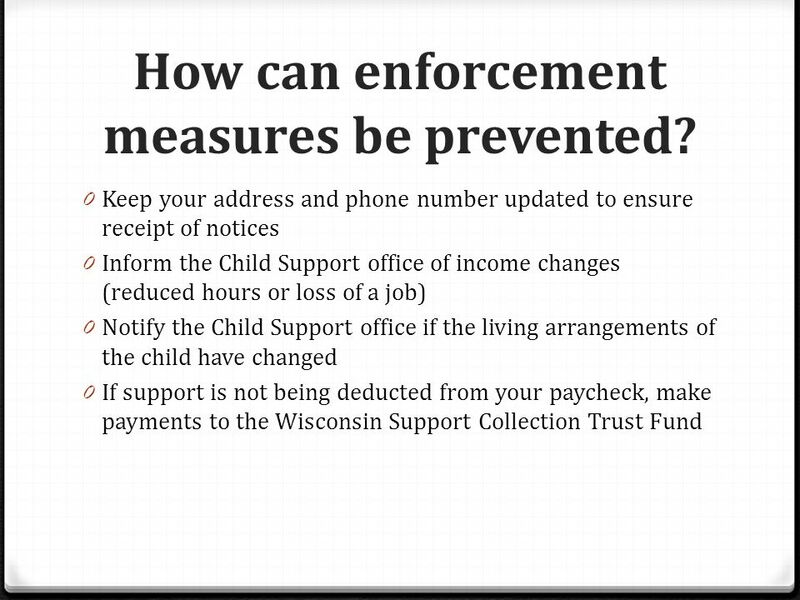 49.22 authorizes Wisconsin’s child support program. 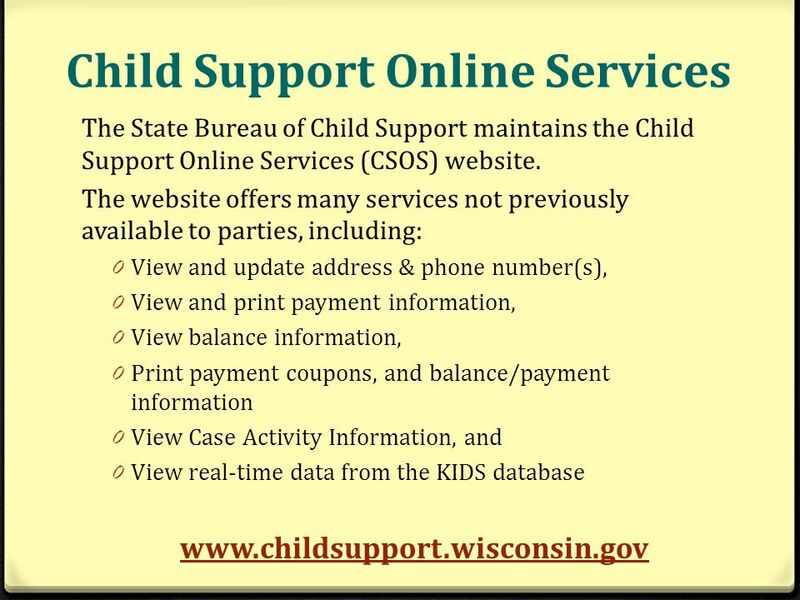 0 The State Bureau of Child Support administers Wisconsin’s program. 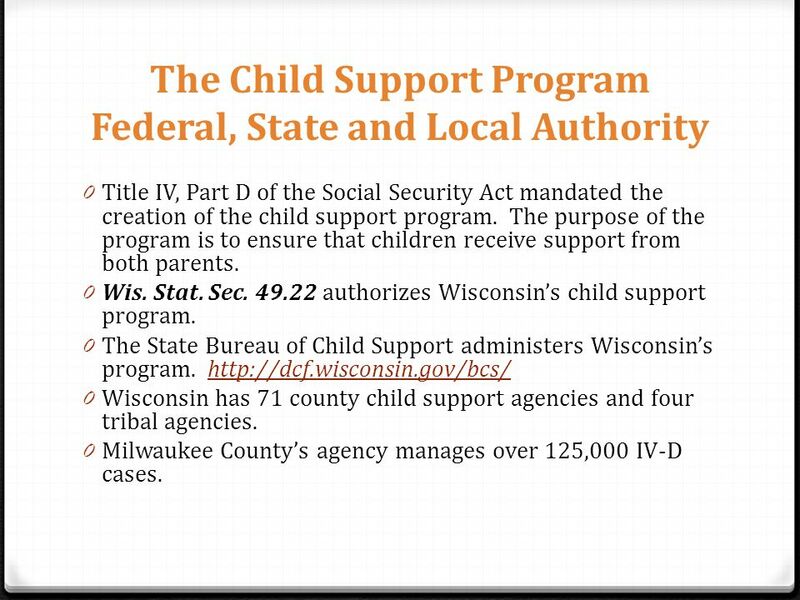 http://dcf.wisconsin.gov/bcs/http://dcf.wisconsin.gov/bcs/ 0 Wisconsin has 71 county child support agencies and four tribal agencies. 0 Milwaukee County’s agency manages over 125,000 IV-D cases. 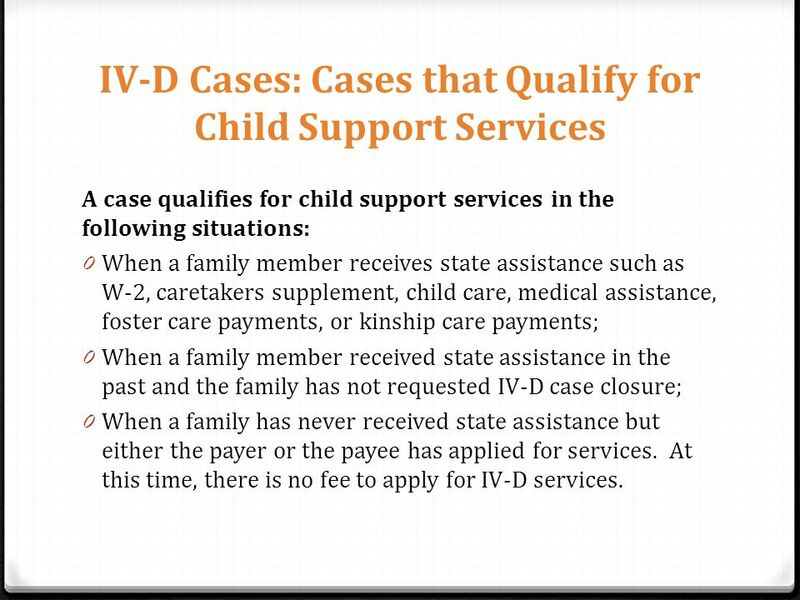 4 IV-D Cases: Cases that Qualify for Child Support Services A case qualifies for child support services in the following situations: 0 When a family member receives state assistance such as W-2, caretakers supplement, child care, medical assistance, foster care payments, or kinship care payments; 0 When a family member received state assistance in the past and the family has not requested IV-D case closure; 0 When a family has never received state assistance but either the payer or the payee has applied for services. At this time, there is no fee to apply for IV-D services. 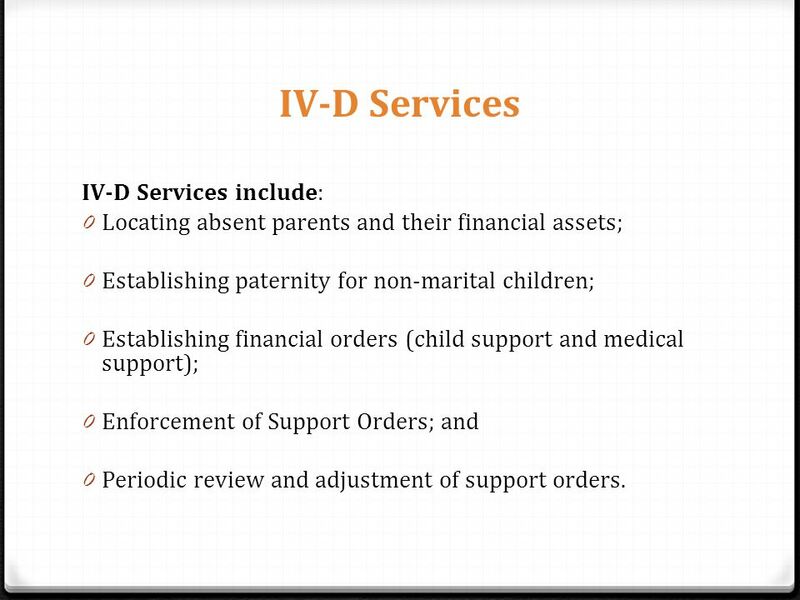 5 IV-D Services IV-D Services include: 0 Locating absent parents and their financial assets; 0 Establishing paternity for non-marital children; 0 Establishing financial orders (child support and medical support); 0 Enforcement of Support Orders; and 0 Periodic review and adjustment of support orders. 6 0 Paternity Establishment: The process of adjudicating a father of a non-marital child, and rights and responsibilities that result. Wis. Stat. 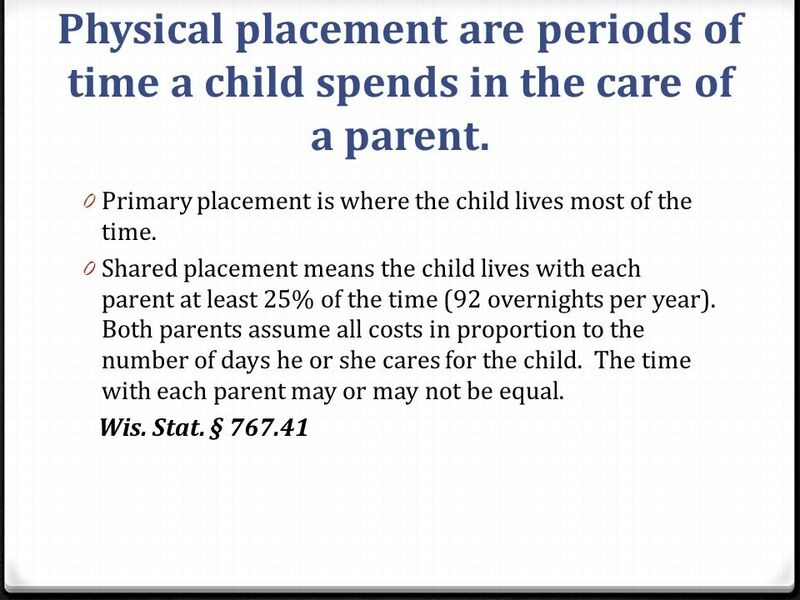 §§767.80 - 767.895 0 Custody and Placement: Court orders that define the parent’s rights regarding decision making for the child and the periods of time a child spends in the care of a parent. Wis. Stat. §§ 767.41 – 767.471 0 Setting Support: State guidelines and court procedures used to set support obligations. Wis. Stat. 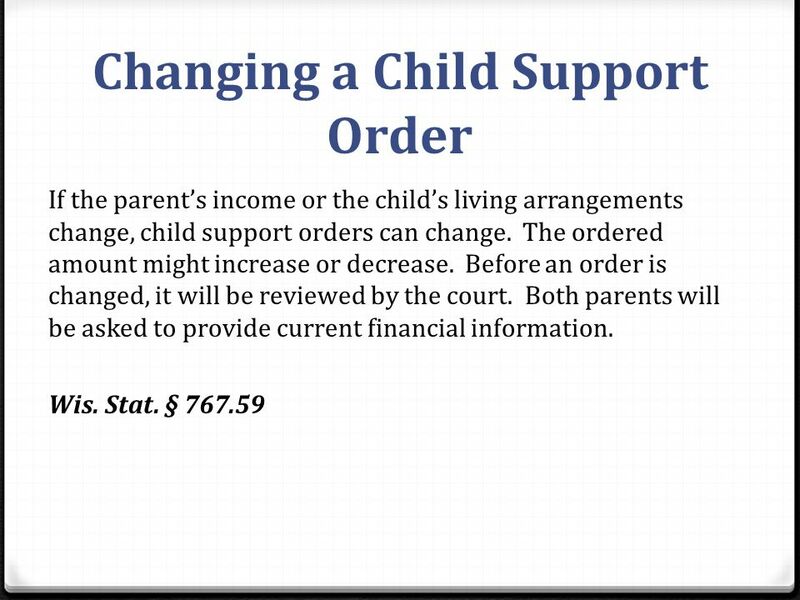 §§ 767.501 – 767.59 0 Changing and Ending Support: Procedures and factors that govern the modification of support orders. The importance of modifying an order when there has been a change in circumstances. Wis. Stat. § 767.553 0 Enforcement of Orders: The legal and administrative methods of enforcing a court order, and the actions a parent can take to respond. Wis. Stat. 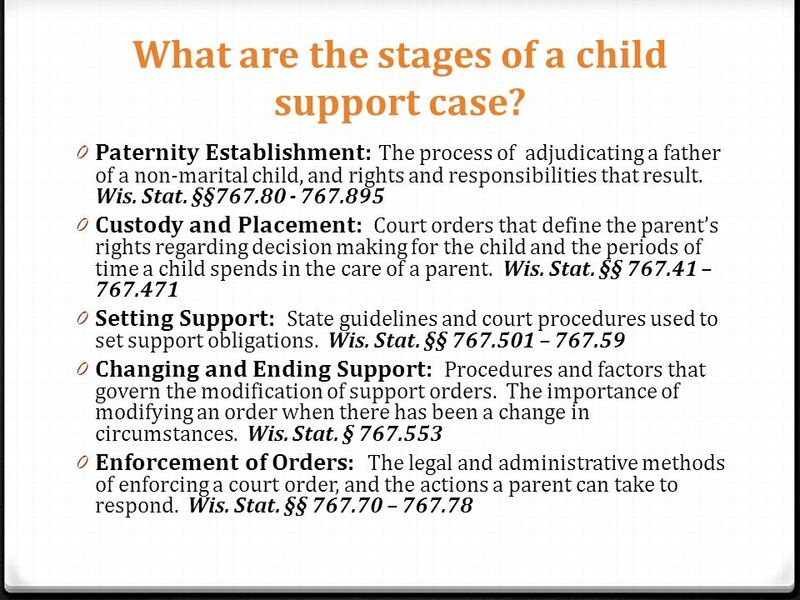 §§ 767.70 – 767.78 What are the stages of a child support case? 7 0 When legal fatherhood is established, the father has rights; 0 The father’s parental rights have to be considered before his baby can be placed for adoption. See Wis. Stat. 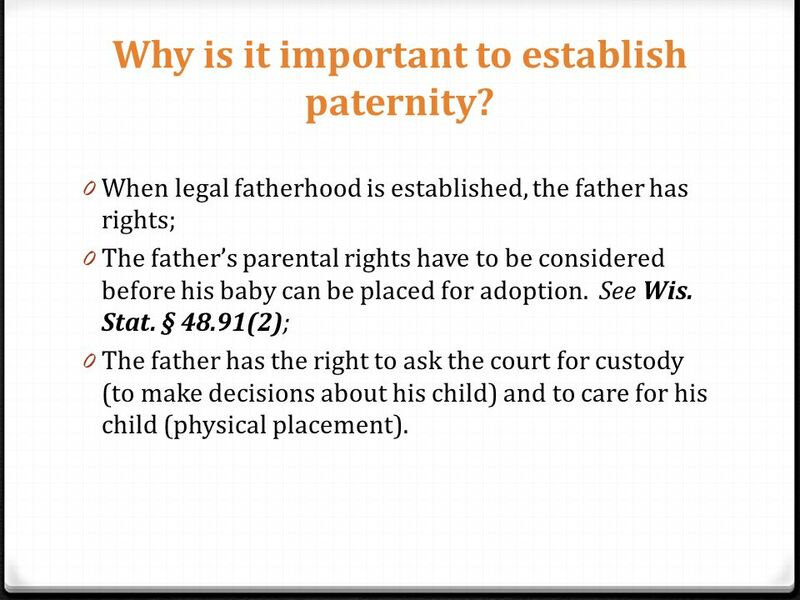 § 48.91(2); 0 The father has the right to ask the court for custody (to make decisions about his child) and to care for his child (physical placement). Why is it important to establish paternity? 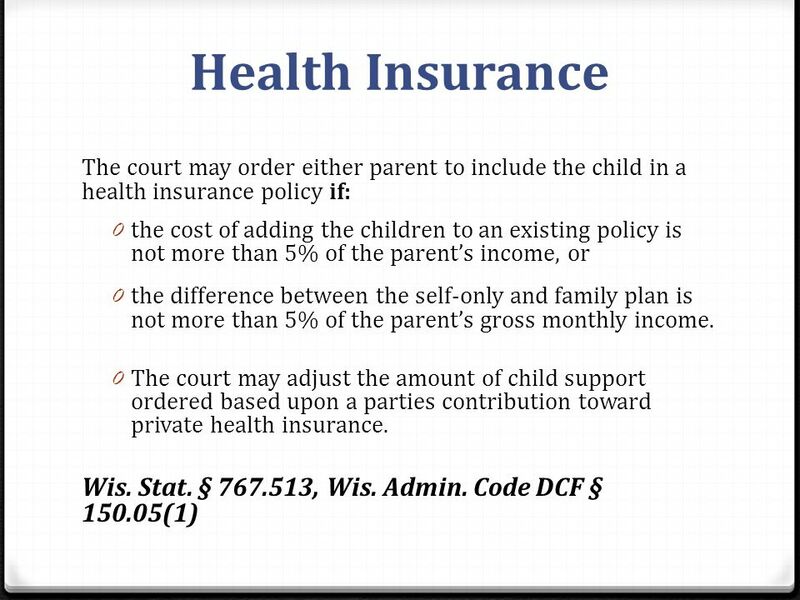 8 0 The child obtains rights to child support and health insurance from the father; 0 The child receives inheritance rights; 0 The child can receive Social Security benefits should the father die or become disabled; 0 The child can get access to the father’s family medical history. This can be important as conditions such as diabetes and sickle cell run in families. 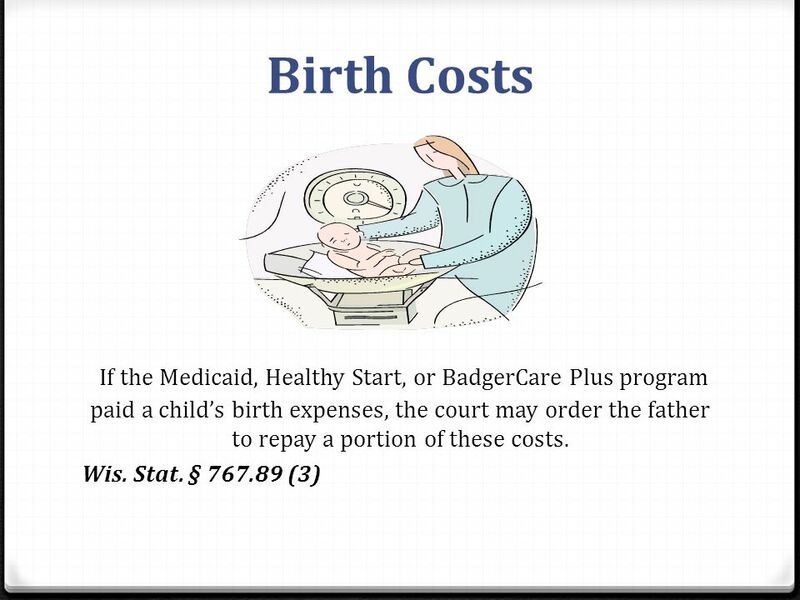 9 Starting a Paternity Case 0 If an unmarried mother is receiving public benefits, the Child Support office will initiate a paternity case pursuant to Wis. Stat. 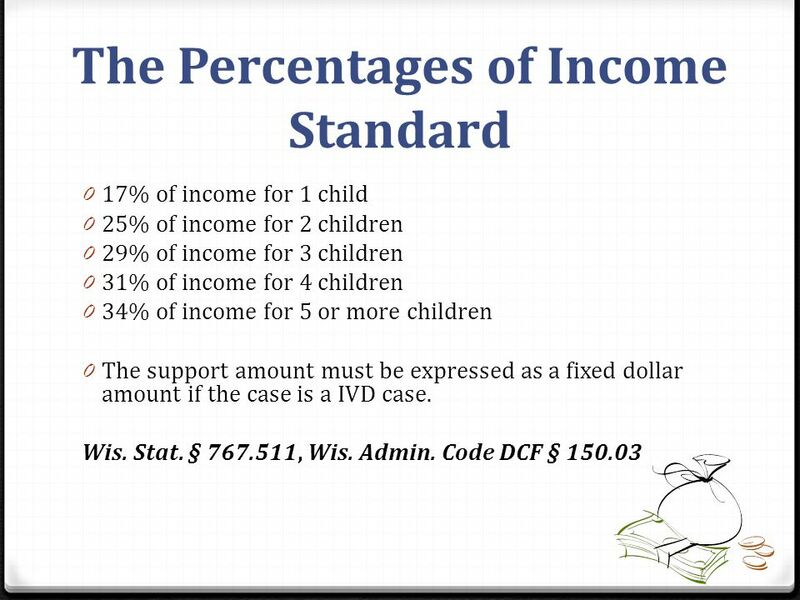 § 49.22 0 Recipients of public benefits are required to cooperate with the Child Support Agency. See Wis. Stat. 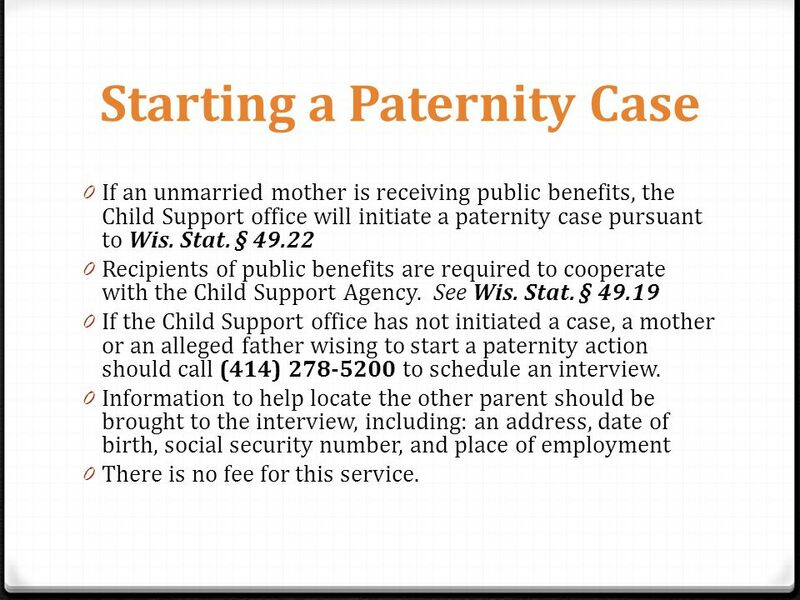 § 49.19 0 If the Child Support office has not initiated a case, a mother or an alleged father wising to start a paternity action should call (414) 278-5200 to schedule an interview. 0 Information to help locate the other parent should be brought to the interview, including: an address, date of birth, social security number, and place of employment 0 There is no fee for this service. 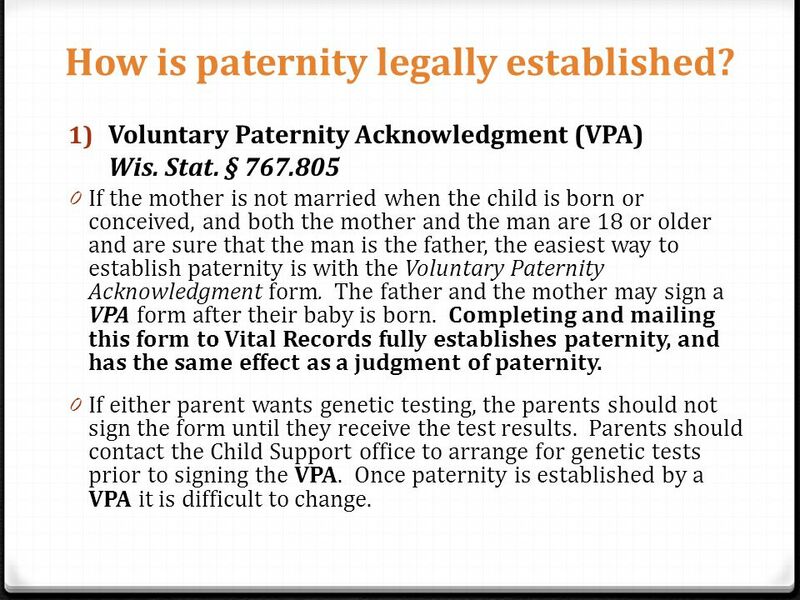 10 1) Voluntary Paternity Acknowledgment (VPA) Wis. Stat. 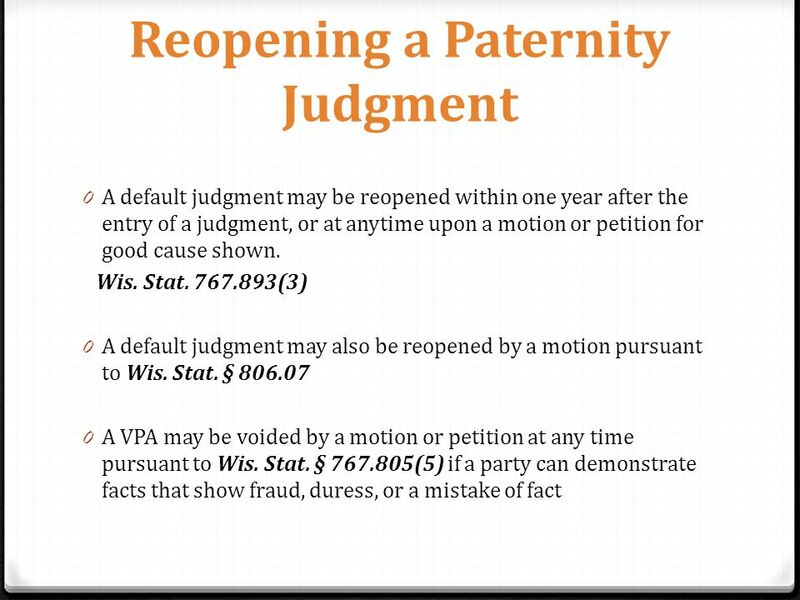 § 767.805 0 If the mother is not married when the child is born or conceived, and both the mother and the man are 18 or older and are sure that the man is the father, the easiest way to establish paternity is with the Voluntary Paternity Acknowledgment form. The father and the mother may sign a VPA form after their baby is born. Completing and mailing this form to Vital Records fully establishes paternity, and has the same effect as a judgment of paternity. 0 If either parent wants genetic testing, the parents should not sign the form until they receive the test results. Parents should contact the Child Support office to arrange for genetic tests prior to signing the VPA. Once paternity is established by a VPA it is difficult to change. 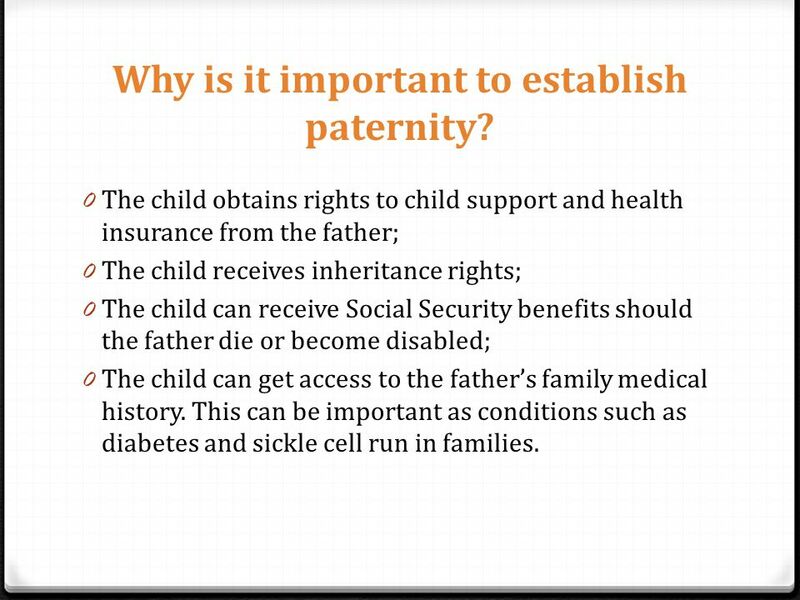 How is paternity legally established? 11 How can a VPA be Rescinded? 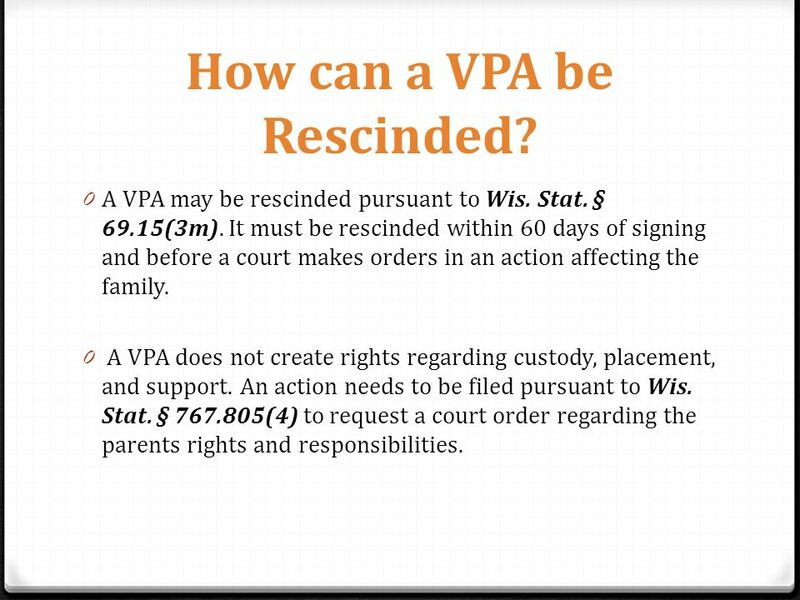 0 A VPA may be rescinded pursuant to Wis. Stat. § 69.15(3m). It must be rescinded within 60 days of signing and before a court makes orders in an action affecting the family. 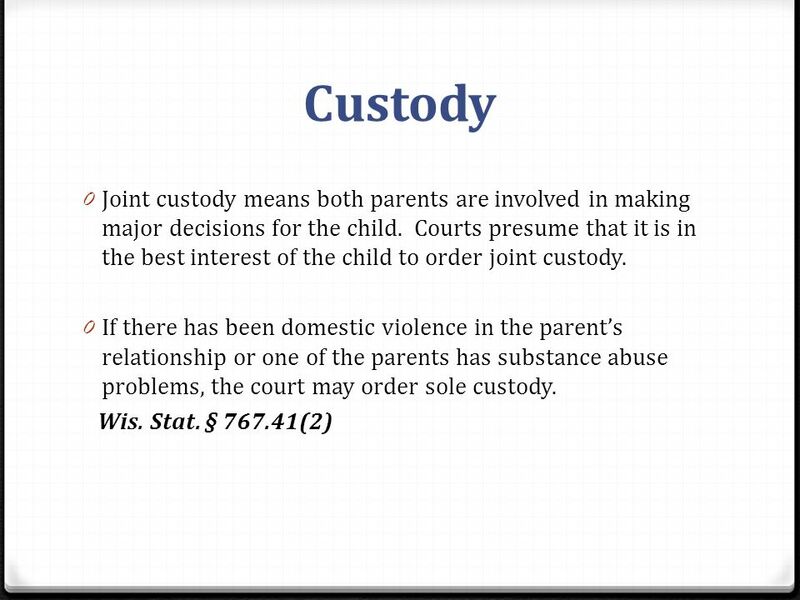 0 A VPA does not create rights regarding custody, placement, and support. An action needs to be filed pursuant to Wis. Stat. 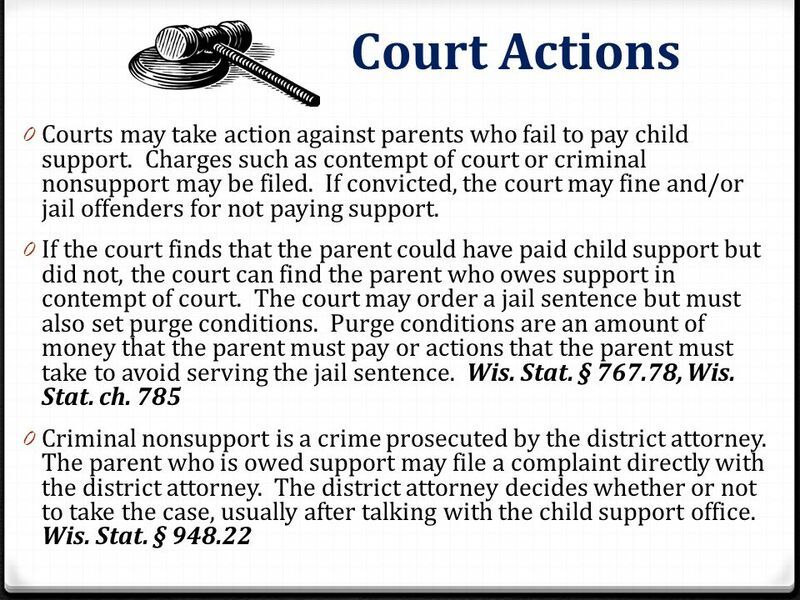 § 767.805(4) to request a court order regarding the parents rights and responsibilities. 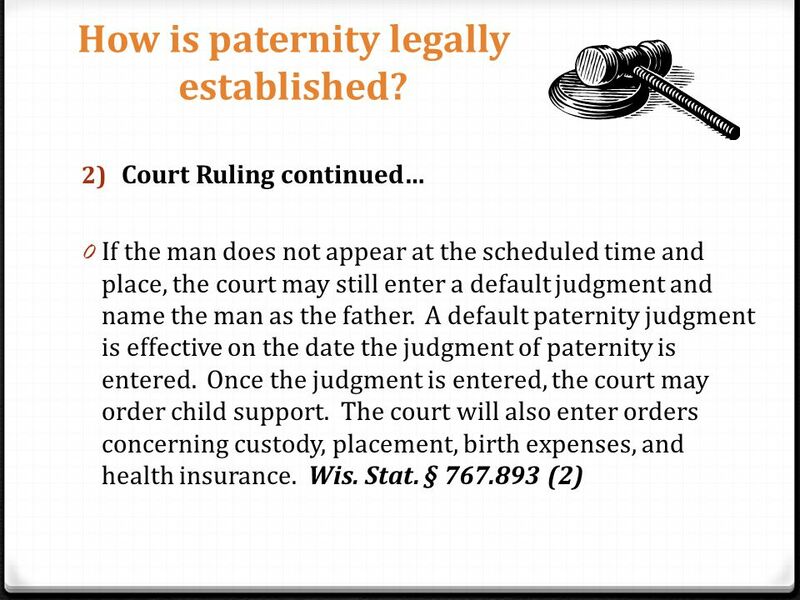 12 How is paternity legally established? 2) Court Ruling First Appearance in a Paternity Case. Wis. Stat. § 767.863 0 At the first appearance the court advises the parties of their rights. These include the right to an attorney and the right to genetic tests. Wis. Stat. § 767.813(5g) 0 It is strongly advised that genetic tests are requested at the first appearance. 0 If tests are requested the parties and child are tested and a new court date is set for the results. 0 If more than one man was sexually active with the mother at the time of the child’s conception, the court will order mandatory tests. 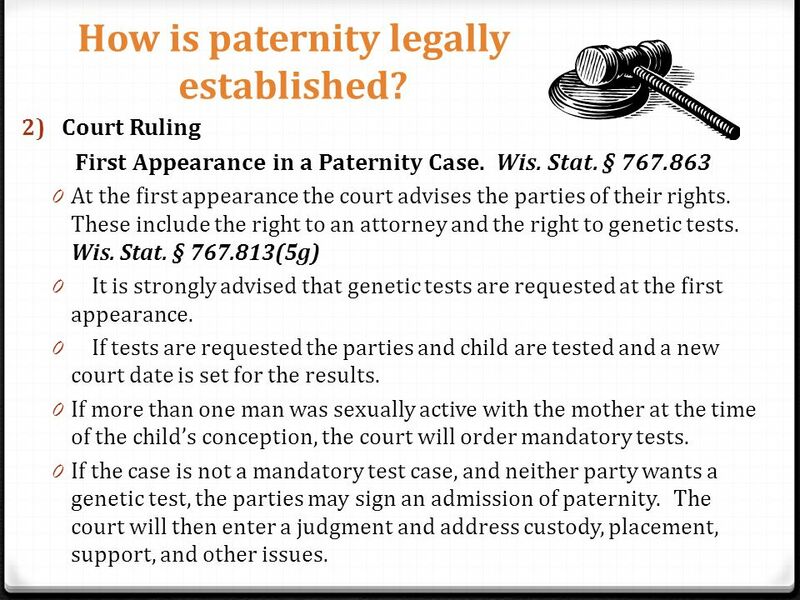 0 If the case is not a mandatory test case, and neither party wants a genetic test, the parties may sign an admission of paternity. The court will then enter a judgment and address custody, placement, support, and other issues. 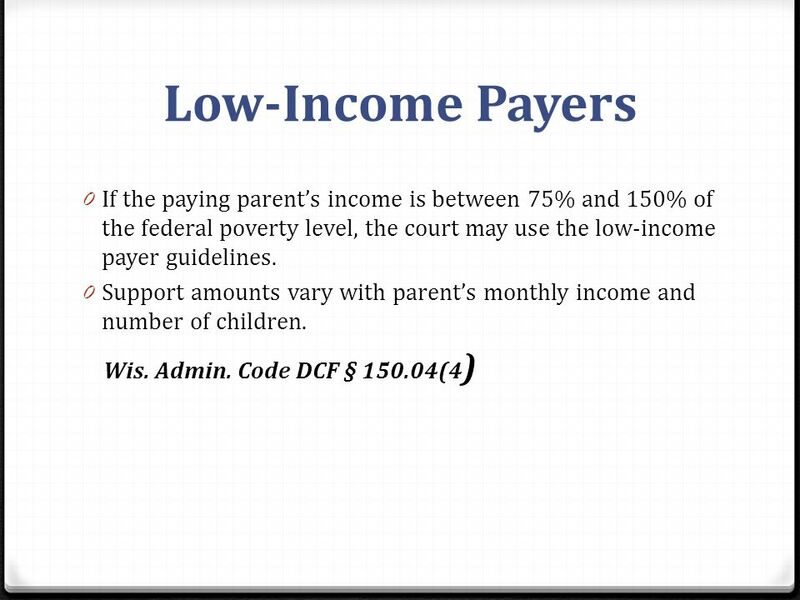 19 Serial Family Parents If a parent supports more than one family, the court may adjust the parent’s income for later child support orders. See Wis. Admin. 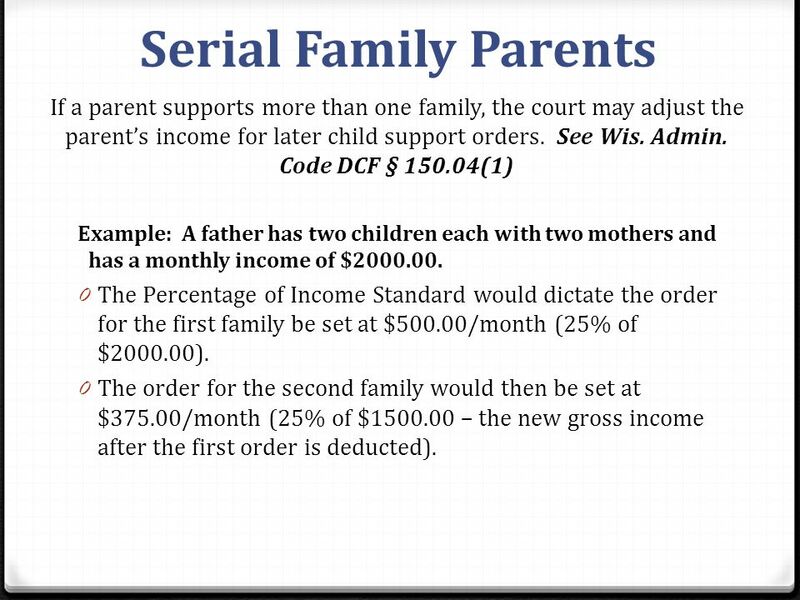 Code DCF § 150.04(1) Example: A father has two children each with two mothers and has a monthly income of $2000.00. 0 The Percentage of Income Standard would dictate the order for the first family be set at $500.00/month (25% of $2000.00). 0 The order for the second family would then be set at $375.00/month (25% of $1500.00 – the new gross income after the first order is deducted). 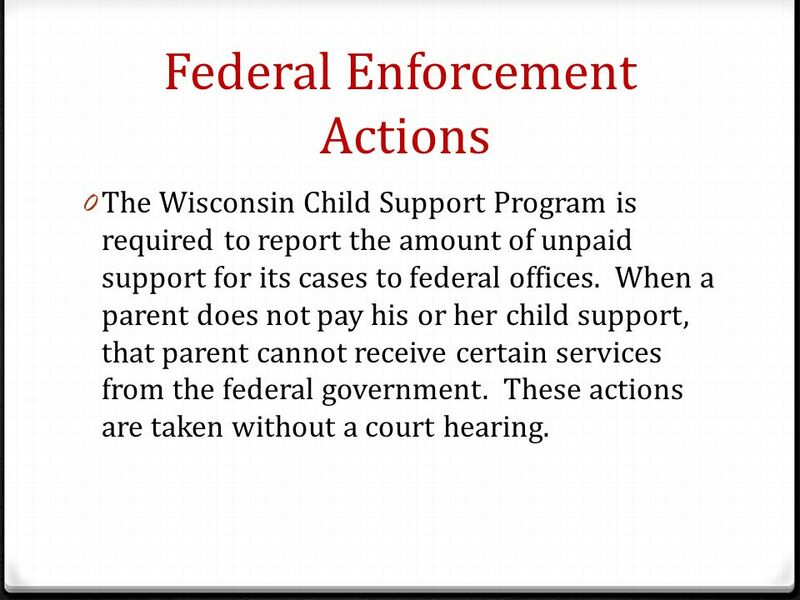 31 Federal Enforcement Actions 0 The Wisconsin Child Support Program is required to report the amount of unpaid support for its cases to federal offices. 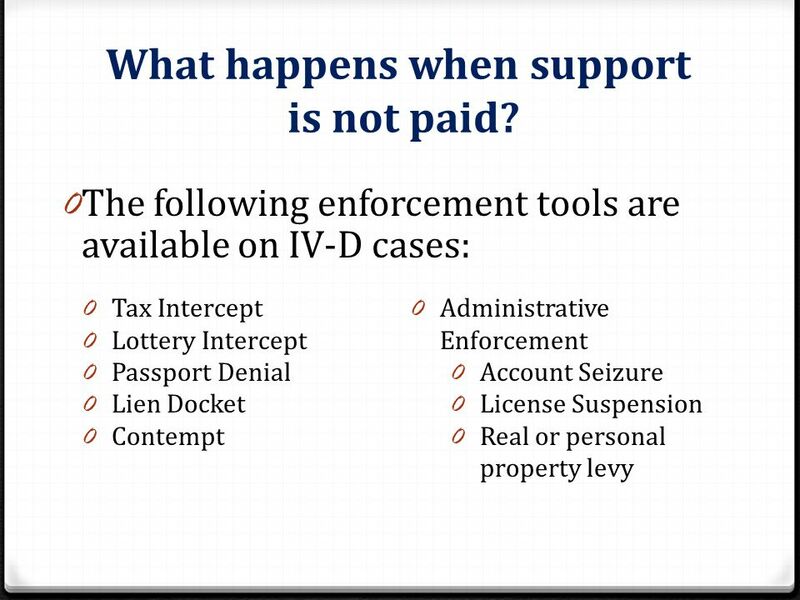 When a parent does not pay his or her child support, that parent cannot receive certain services from the federal government. These actions are taken without a court hearing. 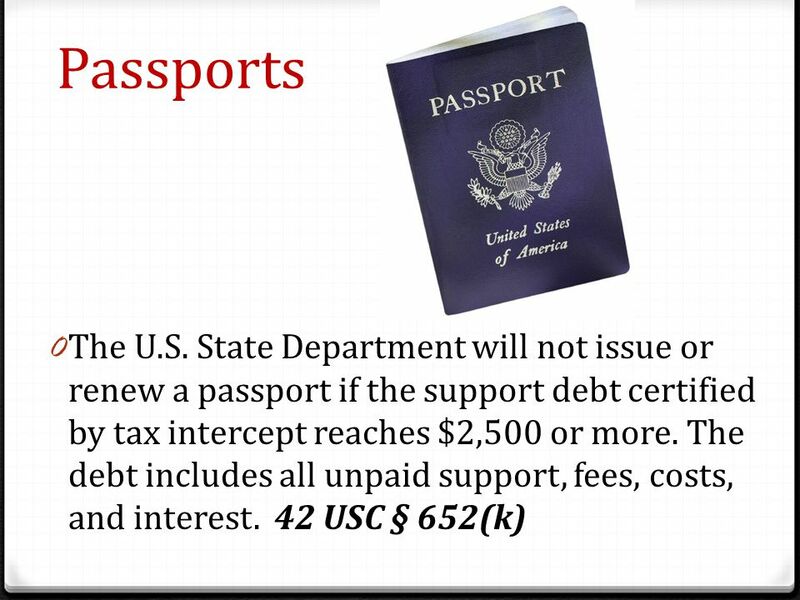 34 Passports If a parent was ever certified for tax refund intercept with a debt of $2,500 or more and has not paid the debt in full, the State Department will not issue or renew the parent’s passport. 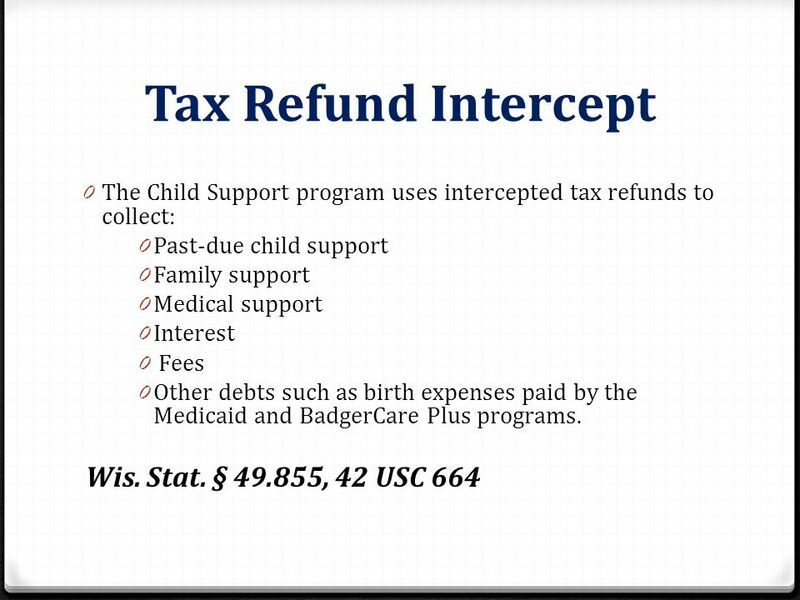 Example: A few years ago, a parent received a letter telling the parent that he or she was certified for tax intercept. The letter stated that the parent owed $6,000. The parent began to pay on the debt, but still owes $2,000. 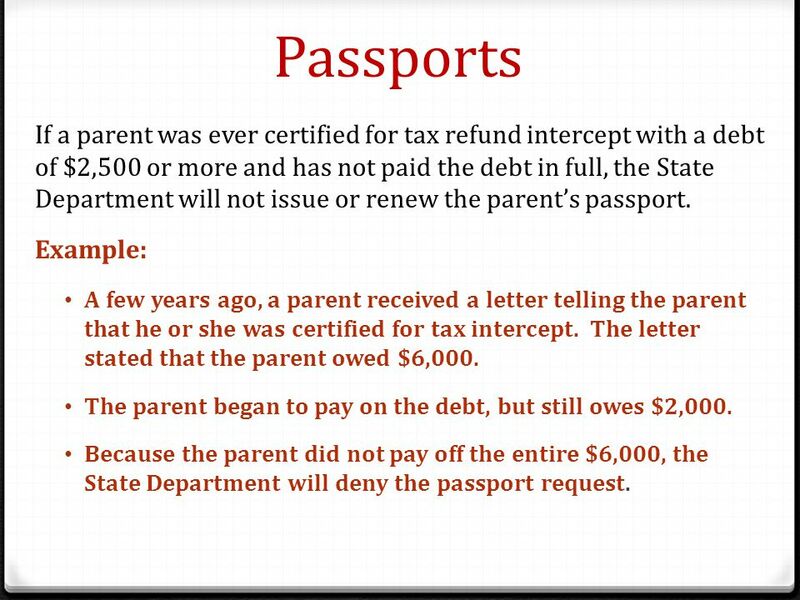 Because the parent did not pay off the entire $6,000, the State Department will deny the passport request. 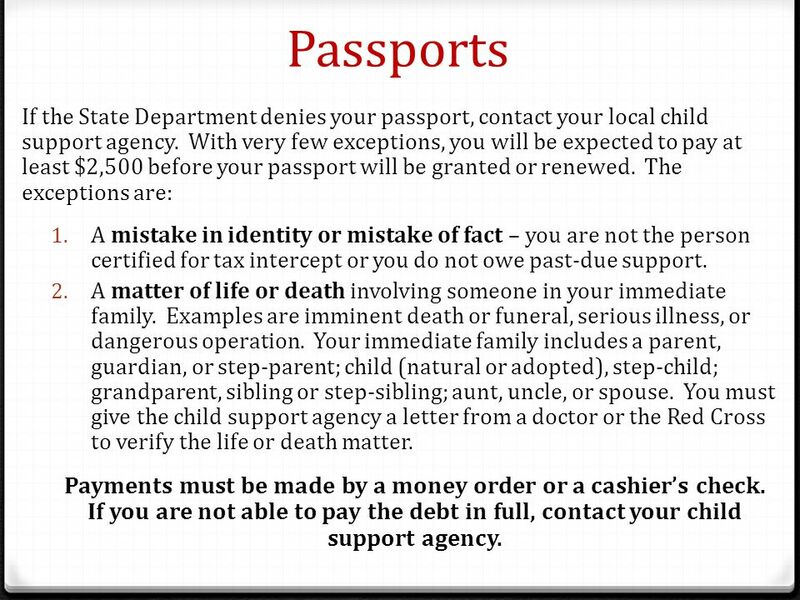 35 Passports If the State Department denies your passport, contact your local child support agency. With very few exceptions, you will be expected to pay at least $2,500 before your passport will be granted or renewed. The exceptions are: 1. A mistake in identity or mistake of fact – you are not the person certified for tax intercept or you do not owe past-due support. 2. A matter of life or death involving someone in your immediate family. Examples are imminent death or funeral, serious illness, or dangerous operation. Your immediate family includes a parent, guardian, or step-parent; child (natural or adopted), step-child; grandparent, sibling or step-sibling; aunt, uncle, or spouse. 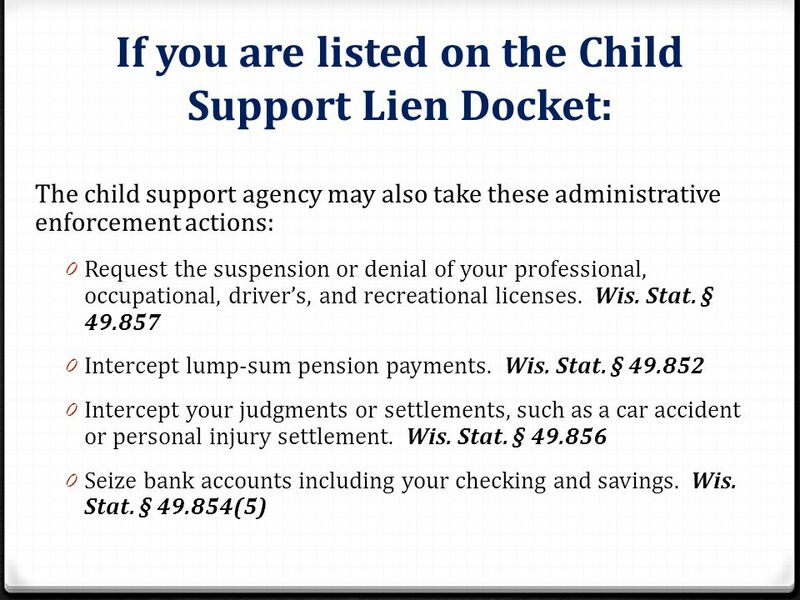 You must give the child support agency a letter from a doctor or the Red Cross to verify the life or death matter. Payments must be made by a money order or a cashier’s check. 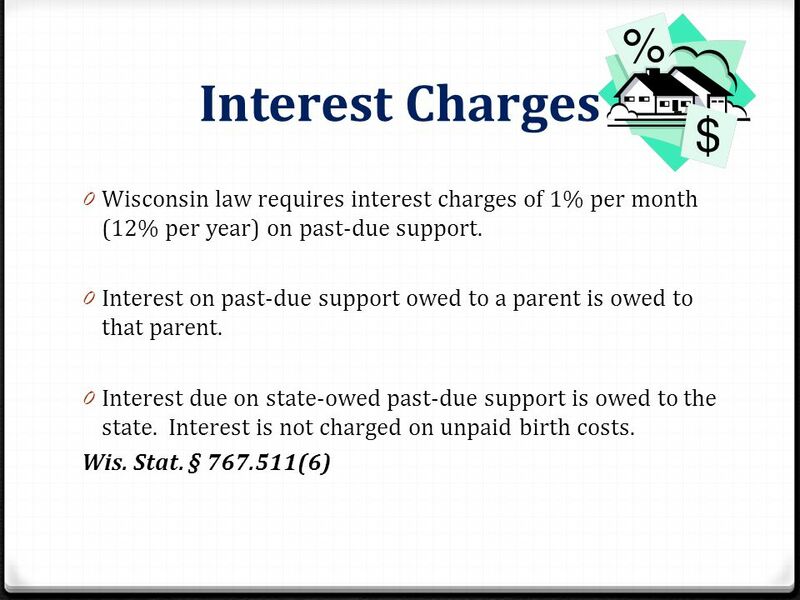 If you are not able to pay the debt in full, contact your child support agency. 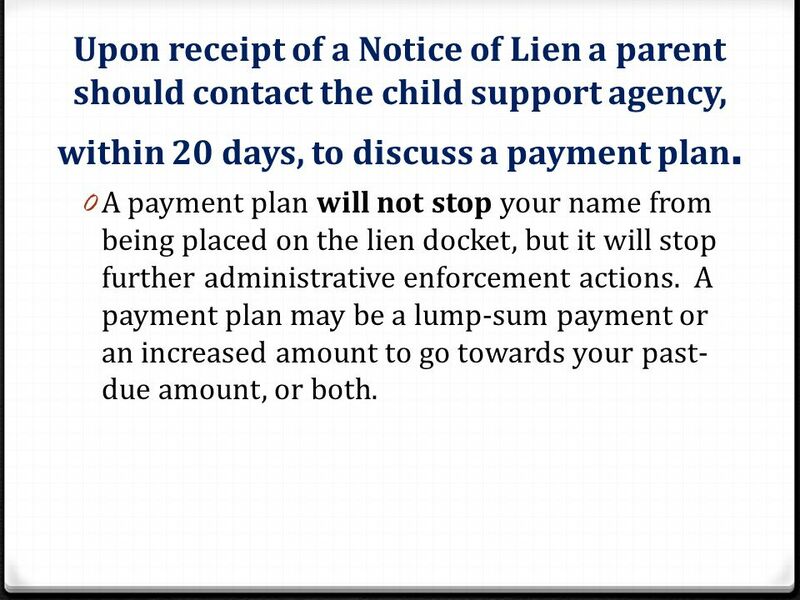 38 Upon receipt of a Notice of Lien a parent should contact the child support agency, within 20 days, to discuss a payment plan. 0 A payment plan will not stop your name from being placed on the lien docket, but it will stop further administrative enforcement actions. A payment plan may be a lump-sum payment or an increased amount to go towards your past- due amount, or both. 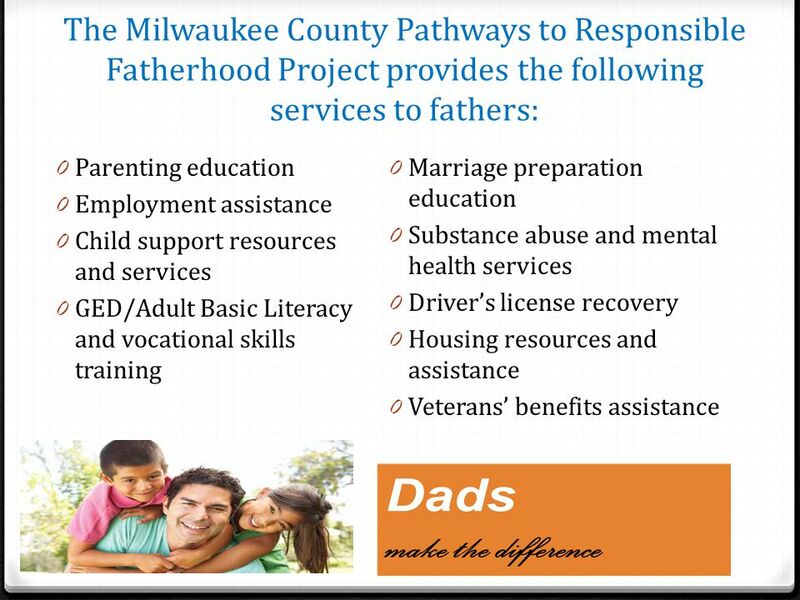 41 Pathways to Responsible Fatherhood The Milwaukee County Pathways to Responsible Fatherhood Project is a new program that provides needed education and services specifically for Milwaukee County’s fathers because kids need their dads. 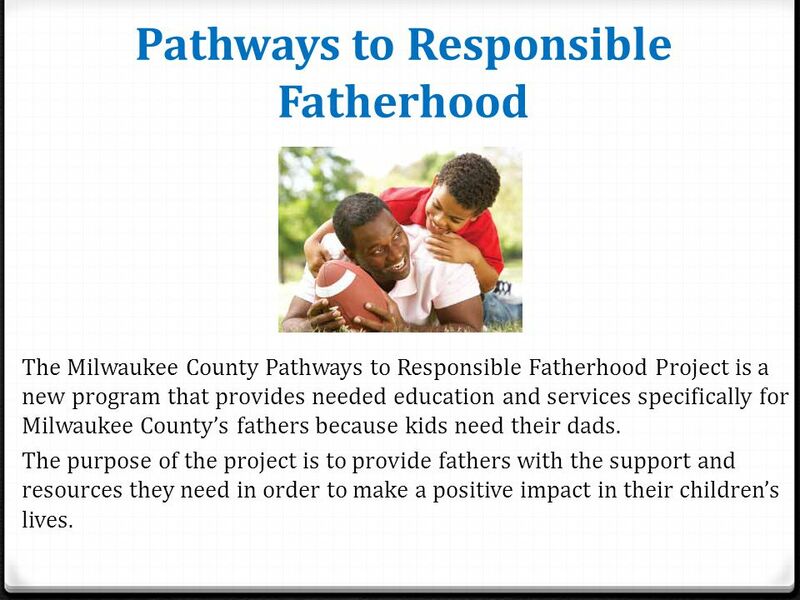 The purpose of the project is to provide fathers with the support and resources they need in order to make a positive impact in their children’s lives. 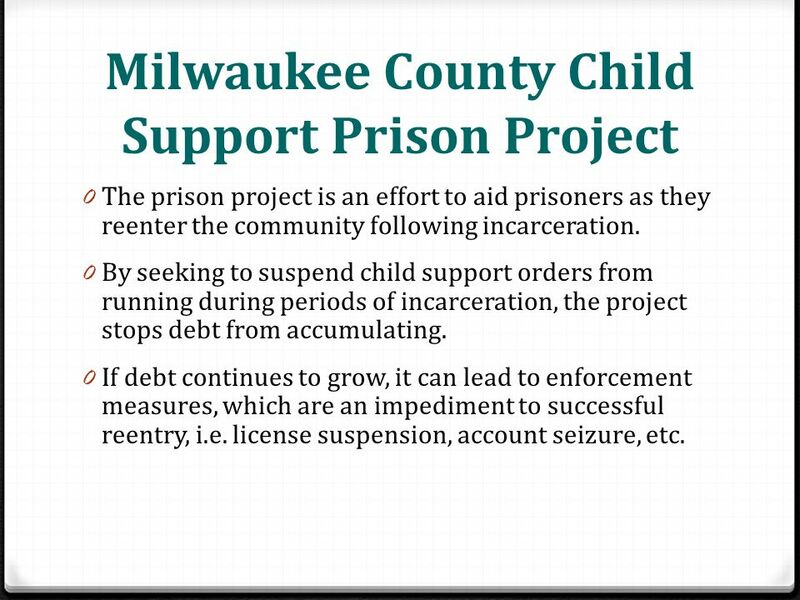 43 Milwaukee County Child Support Prison Project 0 The prison project is an effort to aid prisoners as they reenter the community following incarceration. 0 By seeking to suspend child support orders from running during periods of incarceration, the project stops debt from accumulating. 0 If debt continues to grow, it can lead to enforcement measures, which are an impediment to successful reentry, i.e. license suspension, account seizure, etc. 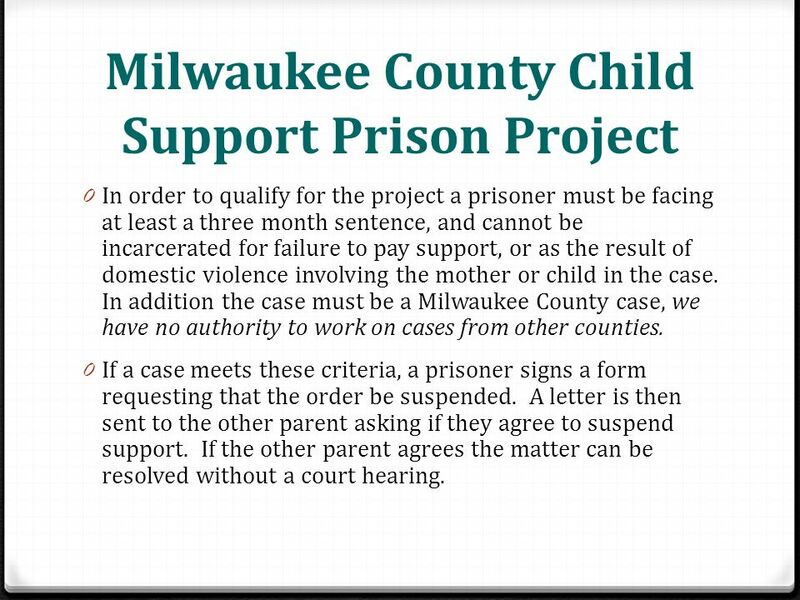 44 Milwaukee County Child Support Prison Project 0 In order to qualify for the project a prisoner must be facing at least a three month sentence, and cannot be incarcerated for failure to pay support, or as the result of domestic violence involving the mother or child in the case. In addition the case must be a Milwaukee County case, we have no authority to work on cases from other counties. 0 If a case meets these criteria, a prisoner signs a form requesting that the order be suspended. A letter is then sent to the other parent asking if they agree to suspend support. If the other parent agrees the matter can be resolved without a court hearing. 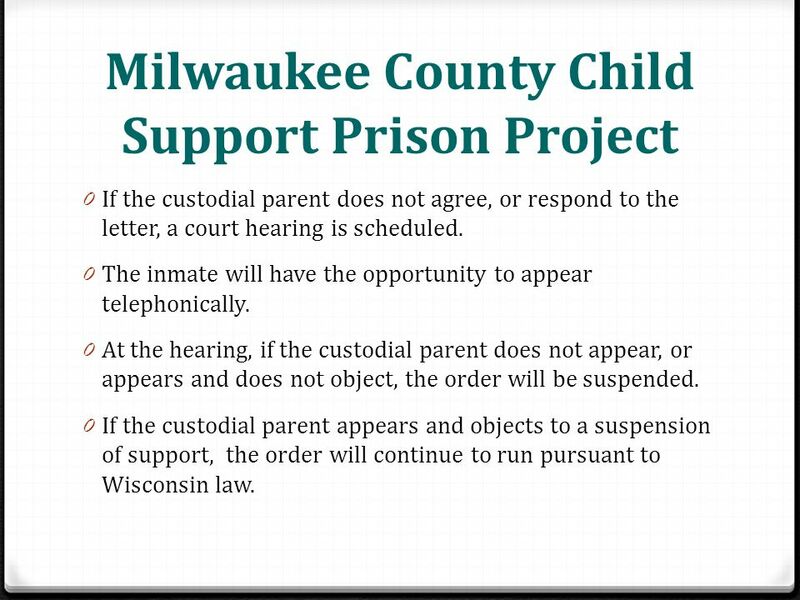 45 Milwaukee County Child Support Prison Project 0 If the custodial parent does not agree, or respond to the letter, a court hearing is scheduled. 0 The inmate will have the opportunity to appear telephonically. 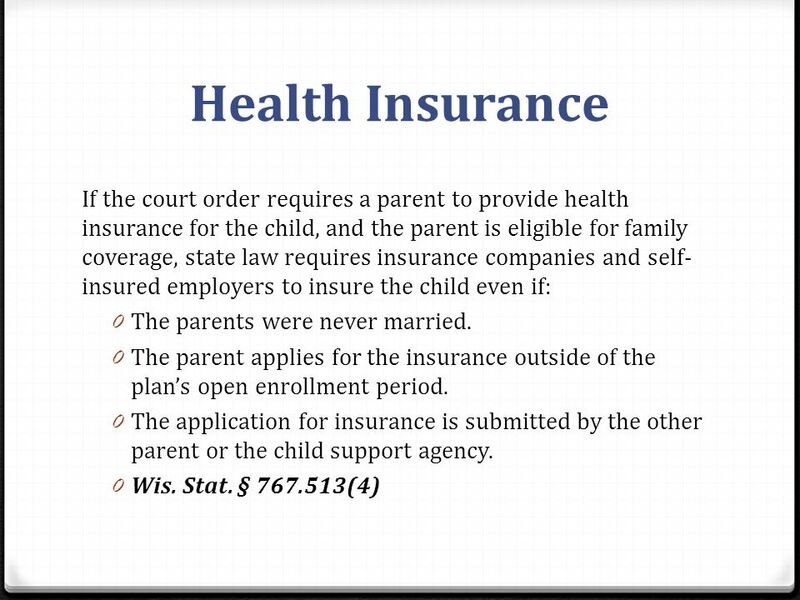 0 At the hearing, if the custodial parent does not appear, or appears and does not object, the order will be suspended. 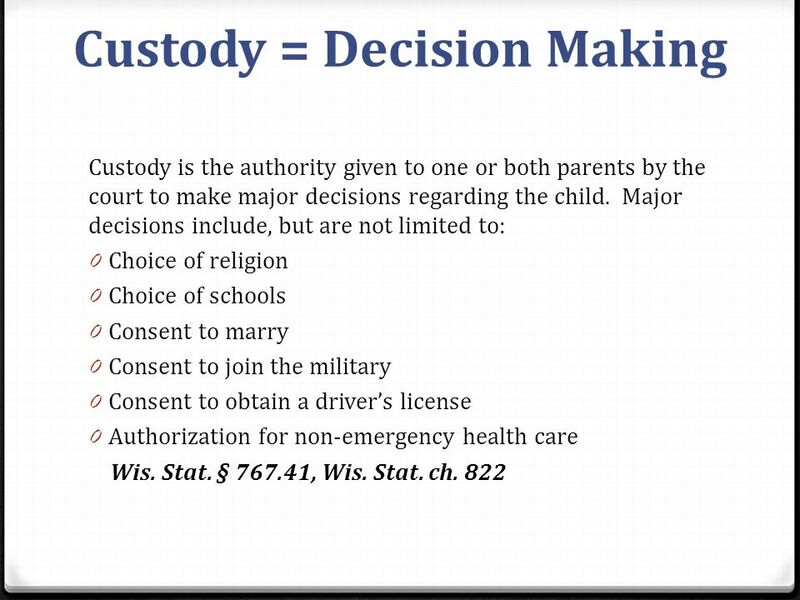 0 If the custodial parent appears and objects to a suspension of support, the order will continue to run pursuant to Wisconsin law. 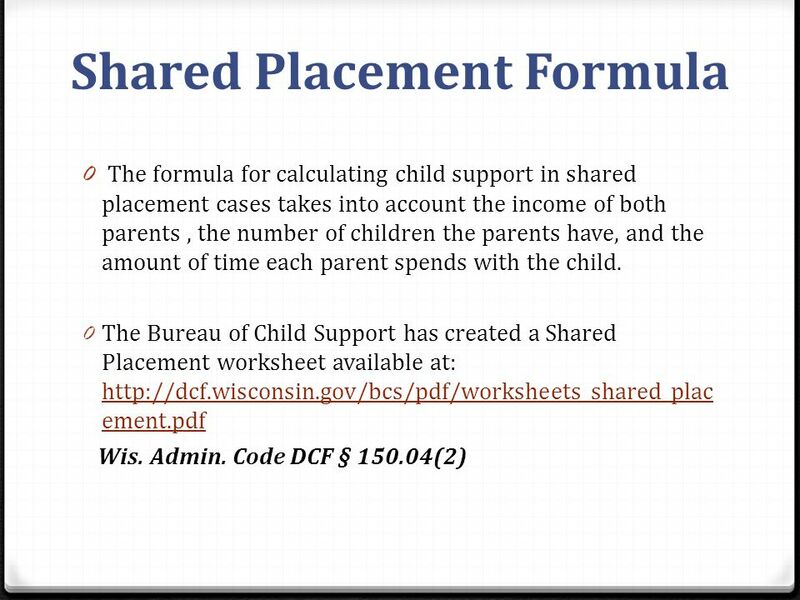 Download ppt "MVLC Brown Bag Seminar: Milwaukee County Child Support Services January 17, 2013." Helping People be Better at Work. EAP services are for you as an employee and for each family member in your household. Who is Eligible? 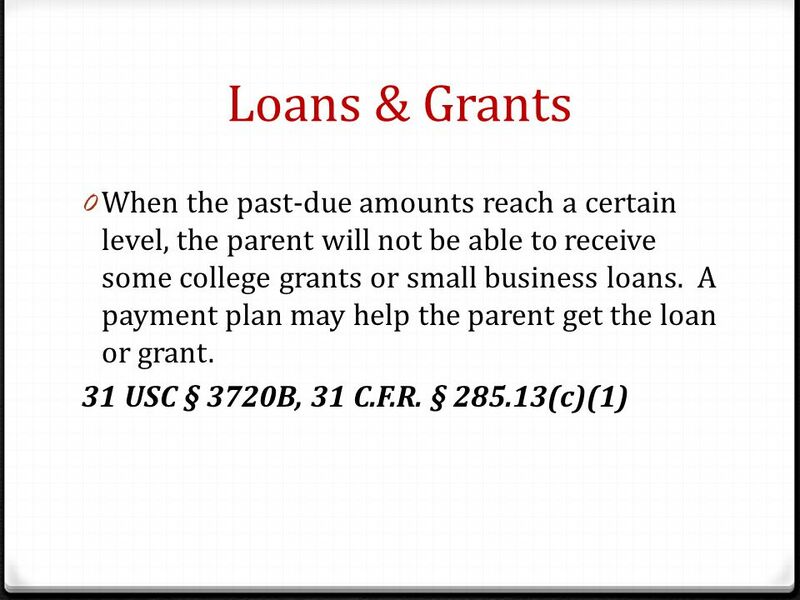 Chapter 9-Section 2 Bankruptcy Choices. Bankruptcy  A legal procedure to relieve a person of excessive debt.  Voluntary bankruptcy-the individual asks. Insurance Coverage Issues, Strategies and Solutions Insurance Coverage Issues, Strategies and Solutions© Beth Sufian, J.D. Sufian & Passamano, L.L.P. Supplemental Security Income (SSI). Getting Acquainted with SSI Here’s a great place to get your basic questions answered…. MONTGOMERY COUNTY CSEA: NEW CUSTOMER ORIENTATION August 29, 2012. Bankruptcy A Resource Guide for Child Support Professionals ERICSA May 2011. Employee Insurance Program Dependent Audit May 1, 2011 Laura Caldwell, Benefits Administrator. Social Security Administration Disability Programs Disability Programs. Micah Legal Aid Volunteer Training.  Collection cases  Bankruptcy  Car Repossession  Utility issues. 1. 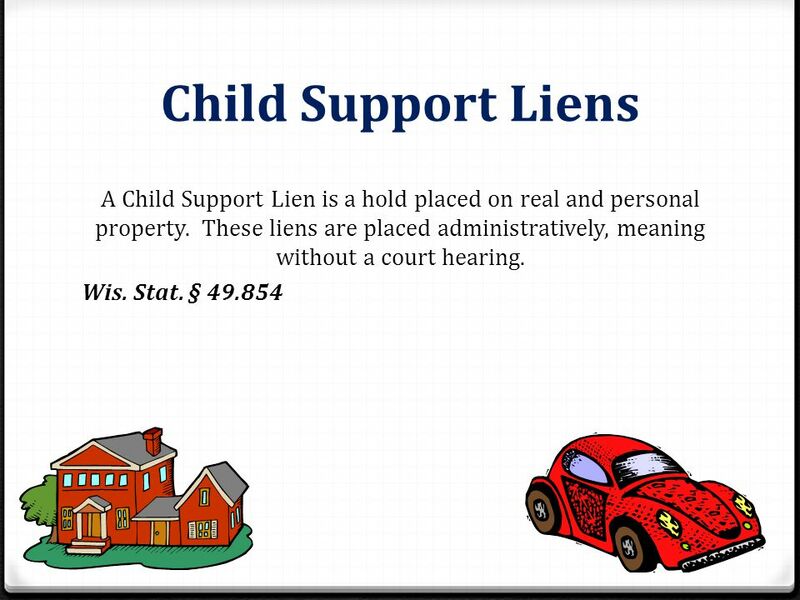 2 Objectives of this course To be able to identify a Child Support type of case. 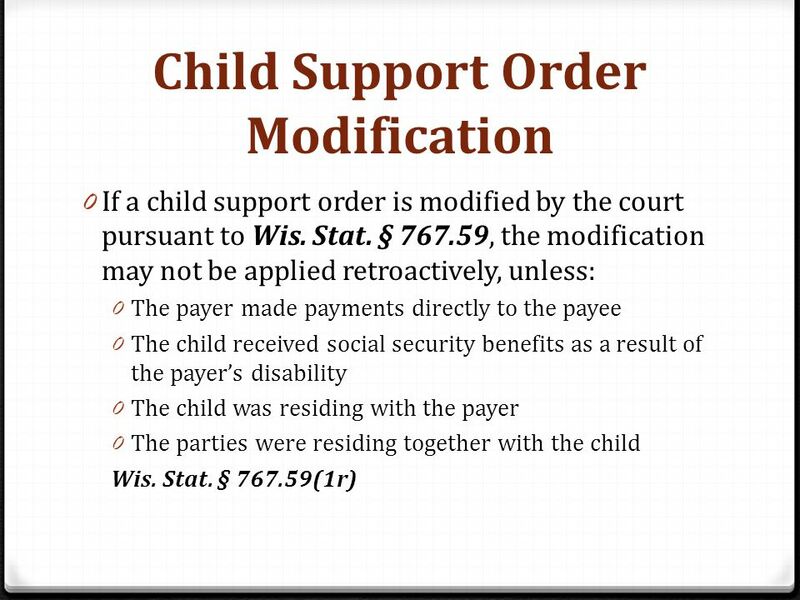 To be able to recognize the forms used to work a Child Support type. FLOW CHART 1 Foreign Reciprocating Country (FRC) Seeks Paternity Establishment Through State IV-D Agency When Noncustodial Parent (NCP) is Living on a.